"Gush Shalom" has acceded to my wish to mark my 85th birthday not with a public celebration, as on my 80th, but with a brain-storming session devoted to the main issues concerning Israel. The event took place on the morning of Sunday 21.12.08 in Tel-Aviv's prestigious Cinematheque hall, under the headline "Until [White] Smoke Comes Out - Views and Confrontations". It consisted of two debates: "Two States for Two Peoples - Realistic or Impossible?" and "The Media: Do They Serve Political Power and Money or the Public?" In the first confrontation, moderated by former Haaretz editor David Landau, Israela Oron (of the Geneva Initiative) and Gilad Sher (former advisor of Ehud Barak and senior Israeli representative at the 2000 Camp David conference) argued that the Two-State solution is viable, while the historian Meron Benvenisti argued that it is impossible, and Dr. Menachem Klein (Bar-Ilan University) took an intermediate position. In the second confrontation, senior journalists Ron Ben-Yishai (who appears in the memorable film "Waltz with Bashir") and Rina Matzliach argued that the Israeli media are free, while Prof. Yaron Ezrachi and senior journalist Ofer Shelach argued that they are shackled. I have to admit that I am moved. Throughout my long life I have not been pampered with expressions of affection. I am much more used to manifestations of hate. Therefore, please excuse me if I am a bit embarrassed. PEOPLE ASK ME: How does it feel to be 85? Well, it is strange. After all, only yesterday I was 42, the youngest member of the Knesset. I don't feel any older or wiser than I did then. 85 is (in the old Hebrew way of numbering by letters) PH. PH can mean "poh", here - and yes, I am here and fully intend to remain here for a while to come - first, because I enjoy it, and second, because I still have some things to finish. PH can also mean peh, mouth - the mouth that enables me to voice my thoughts. I would like to take this opportunity to share with you some of the thoughts that are occupying my mind today. What is special about 85-year-olds in Israel? First of all, we are the generation that founded the state. As such - I feel - we bear an additional responsibility for what is happening here. If our state is not what we imagined it should be - it's our duty to act to change it. AND HERE we face a strange paradox. We are partners in a historic success. And we are partners in a dismal failure. Perhaps only members of my generation can fully grasp the extend of our success in the transformation of the national consciousness. On the morrow of that war, the '48 war, when some of us said that there exists a Palestinian people and that we must make peace with them, we were a tiny handful here and in the whole world. We were laughed at. There are no Palestinians, we were told. "There is no such thing as a Palestinian people!" Golda Meir was still asserting much later. Is there anyone today who denies the existence of the Palestinian people? We argued that in order to achieve peace, a Palestinian state must come into being. They laughed at us. What? Why? There is Jordan. There is Egypt. There are 22 Arab states. That's enough! Today it is a world-wide consensus - two states for two peoples. We said that we must talk with the enemy, and the enemy was then the PLO. Four cabinet ministers demanded that I should be put on trial for high treason when I met with Yasser Arafat in Beirut during the siege. All four of them later met with Arafat, and the State of Israel signed official treaties with the PLO. True, the treaties were not implemented and did not lead to peace. 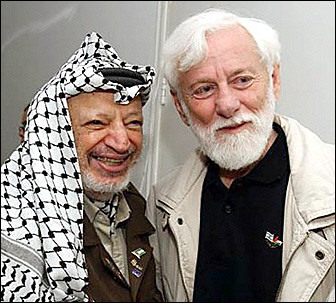 But the mutual recognition between Israel and the PLO, between Israel and the Palestinian people, became a fact. That was a revolution, and it cannot be reversed. Today we are saying: we must talk with Hamas. Hamas is an integral part of the Palestinian reality. And this idea, too, is gaining ground. What an uproar we caused when we said that Jerusalem must become the capital of the two states! Today almost everybody knows that this must happen, that it will happen. I have devoted 60 years of my life to this struggle, and it is still in full swing. But we have defeated the idea of a Greater Israel and put forward the alternative of the two states, which has carried conviction in Israel and throughout the world. So much so, that even those in the successive Israeli governments who strongly oppose the idea are now compelled to pretend to support it in order to attract votes. Think about this when you feel despair. Look at the whole picture, not only at the nearest small part of it. BUT AS BIG as our victory is our defeat. It is enough to look at these coming elections: the three big parties talk almost the same language, and not one of them puts forward a plan for peace. There are small parties which say good and honest things, but at this juncture we simply need more than that. What is lacking is a major political force that is ready to come to power in order to make peace. It is quite clear that the results of this coming election will be bad - and the only question is whether they will be just bad, or very bad, or even worse. Why is this happening? There are many reasons, many pretexts. We criticize - and rightly so - many things, the media, the education system, all our successive governments, the President of the United States, all the world. But I miss one criticism - the criticism of ourselves. My father used to tell me: if the situation is bad, the first thing to do is to ask yourself if you are alright. So I am asking: Am I alright? Are we alright? Yes, we have voiced the right ideas. Our ideas have won. But what have we done to realize these ideas in practice, on the political battlefield? Politics is a matter of power. What have we done to create a progressive political force in Israel? How did it happen that the Left, the camp of peace and progress, has almost been eradicated from the political map? Why don't we have political power, why don't we have, for example, even one newspaper, radio or TV station? How did the Israeli Left lose, in the last generation, all its levers of power? We in the peace camp include many wonderful men and women, who confront the army every week in the fight against the Wall, who monitor the checkpoints, who refuse to serve in the occupation army, who fight against the occupation in dozens of ways. Many of us, of all ages, take part in these actions. But while we stand and protest, the settlers rush ahead. Another goat and another dunam (1000 square meters), another hill and another outpost. Sometimes I, too, have the feeling that the dogs bark and the caravan moves on - and I am not content with being the dog. We chase the mosquitoes, but the swamp that produces the mosquitoes gets bigger and bigger. The swamp is political. Only a political force can drain it. In other words: only a force that can confront the ruling powers, influence the decisions of the government and the Knesset. That is a historic failure, and we bear the responsibility for it. IF I may be permitted to voice a birthday wish: the day after the elections I would like us to start thinking about the next elections. We have to think anew. From the ground up. Examine everything we have done up to now and find out where we went wrong. Why did we not succeed in convincing enough of the young, of the Oriental Jewish community, of the immigrants from Russia, of the Arab community in Israel, of the moderate religious sector - that there is somebody to talk with, that it is possible to bring about change, that indeed - we can! Why did we not succeed in touching the heart of the young generation that is disgusted by politics - by the politics they know? What is needed is something completely new, a new act of creation. I would say: we must prepare the ground for an Israeli Obama. Obama means: to kindle hope where there was no hope before. To demand a change from the foundations up and believe that it is possible to bring about this change. To ignite the enthusiasm of masses of young people for a message that stirs the heart, a message of ending the occupation, of social justice, of caring for the planet. The longing for a different system - secular, just, decent, seeking peace. The new message must address the mind and the heart, speak to the emotions and not only to the intellect. It must arouse again the idealism that is hiding in many a heart and dare not show its face. The great obstacle to such an explosion is despair. It is so much easier to despair. So much more comfortable. It doesn't demand anything. It is easier to say that everything is lost. That they have stolen our state. But pessimism, as is well known, does not give birth to anything, it just leads to internal or external emigration. I refuse to be pessimistic. In my 85 years I have seen too many unexpected, surprising, amazing, things - both good and bad - for me not to believe in the unexpected. Obama was unexpected, and here it happened before our very eyes. The fall of the Berlin wall was unexpected, and nobody could even have imagined it a moment before it happened. Even the victory of the Greens in the recent municipal election in Tel-Aviv was like that. I WANT to propose the start of a new endeavor a day after the elections. I would like the best of the intellectuals and the peace activists, the social activists and the fighters for the environment to gather and start thinking together, in order to bring about the Israeli miracle. Perhaps there should be a grand congress of those who want change, a Sanhedrin of peace and human rights activists, a kind of alternative Knesset. From the heights of my 85 years I want to call all those to whom our future here is close to the heart, Jews and Arabs, and especially the young, to mobilize for a joint effort to prepare the ground for the big change, for the Other Israel, for a state where it will be fun to live, an Israel we can be proud of. This is not a game that can be played between existing organizations, but a completely new political creation, that will speak a new language, that will bring a new message. I believe that this will happen, if not tomorrow then the day after. I wish for myself, and for all of you present in this hall, that we shall see it with our own eyes, that we shall be partners, that we shall be able to say: we have succeeded, we are entrusting the state to good hands. AND NOW I want to express my heartfelt thanks to all of you, my friends, who have come to mark my birthday with me by exchanging views and debating the issues that are so important to all of us. Heartfelt thanks to the moderators and the speakers, who have bared the issues for us, to the organizers of this beautiful event, to the members of Gush Shalom who made it possible. Thanks to all of you, who have come from near and afar, and thanks for the good wishes you have showered on me. I couldn't imagine a more enjoyable and exciting birthday. Thank you. Thanks for reprinting this awesome message. If only words of humility and wisdom, such as these gems from Avnery, would be broadcast far and wide, instead of the nonsense of the general media. Again, thanks to Planetary/USA for this enlightenment. Gen. Stanley McChrystal, commander in Afghanistan and Monty Python fan, has put on quite a show of insubordination in the past month or so in an attempt to cram his escalation plan down the world’s throat. He has waged open information warfare in the media, right-wing and otherwise, against President Barack Obama. I wonder how much longer Obama will put up with it. More to the point, I wonder if he can stand up to it.